As the kids head back to school, there's a constant bevy of chaos in the mornings that reminds us summer break is truly over. Slowly we try to work our way back into the school-time swing. The best way to start the day off right is with breakfast. Although getting everyone up and dressed is no small feat. (*by dressed I'm talking about real clothes and not the Spiderman costume my son puts on every morning*) Getting fed and out of the door before the school bell rings takes an act of congress. So I have tried to develop a new strategy when it comes to making school mornings great. This strategy involves a touch of Nutella in the mornings, along with oats, flour, and a little buttermilk. 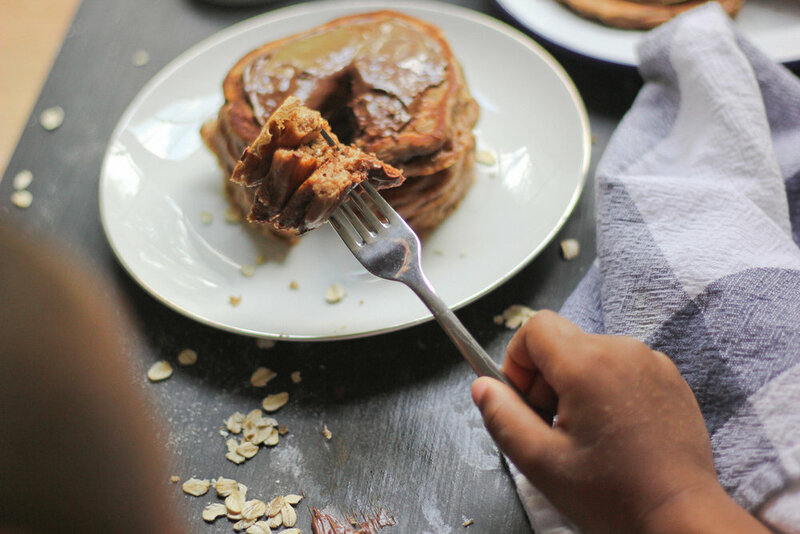 These ingredients, with a dash of a few others, went into the Nutella Oat pancakes that have become a fast favorite in our breakfast routine. The kids love them even without syrup and often we add a few slices of bananas to adorn the top. Pancakes are such a perfect canvas for additional flavors. They give you the ability to add just about anything you desire to jazz them up. Well my kids desire the tasty flavor of their favorite chocolate hazelnut spread Nutella. With the breakfast blues solved, my son and I wanted to make our summer fun continue well into the school year. The best way to keep the summer fun alive, even once school starts back, is eating things that remind you of summer, like ice cream. So why not turn breakfast into a work of summer-themed art. My five year old did his best rendition of an ice cream cone out of pancakes as well. Which coincidentally looks a lot like the floor around he’s seat at the dinner table, as there always seems to be some abstract display of food art on the floor after he eats. Luckily, this time he managed to keep it on the table. In a large bowl, whisk together the first 5 ingredients to combine. Make a well in the center and add the buttermilk, egg and nutella into the well. Stir to incorporate the wet ingredients to form the batter. Heat a lightly oiled griddle or frying pan over medium high heat. Pour or scoop the batter onto the griddle, using about ¼ cup for each pancake. When bubbles start to appear around the edges (about 2- 3 minutes), then flip and cook until the other side is golden. Repeat with the remaining batter. Serve pancakes while warm with sliced bananas or syrup or whatever topping your kids will love. Enjoy! Notes: Pancakes are great make ahead food, which is wonderful for the weekday morning rush. The best way I’ve found is to wrap the pancakes individually in plastic wrap and then freeze them. In the morning, pop them in the microwave for about 60 seconds for 5 pancakes and just like that you’re in nutella pancake paradise.